At Colina Dental, we have invested in the newest and best technology to create the smile of your dreams. 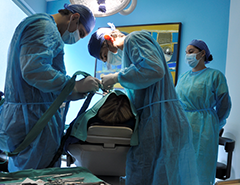 Simplant, Surgiguide and Immediate Smile are some of the products we use for guided surgery. When surgery is necessary to restore the natural look and functionality of your smile, Colina Dental has the experience you need at prices you can afford. 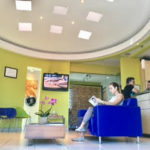 The professionals at Colina Dental are recognized within Costa Rica and around the world as leaders in dental and oral surgery. Whether you need a dental implant surgeon, a cosmetic dental surgeon, or an oral surgeon, Colina Dental is proud to offer the leading specialists in these fields to ensure your complete safety and optimal results. Wisdom teeth are the last set of teeth to develop. Often, one or more of these teeth become “impacted” between the jawbone and your gums, resulting in swelling, pain, and infection. If left untreated, impacted teeth can cause permanent damage to nearby teeth, gums, and bone and can also lead to tumors that can destroy entire sections of your jaw. Colina Dental can surgically remove your impacted teeth, giving you a healthy smile at prices that will make you smile. real teeth and work to stabilize your mouth and other artificial teeth, giving you a beautiful, natural smile. If you have missing teeth, your jawbone may become weak or diminished over the years. This results in poor quality or insufficient bone for dental implants. At Colina Dental, we can graft new bone, allowing you to grow and replace bone for dental implants that will give you a beautiful smile and fully functional mouth. are removed, the new dental implants need sufficient bone to hold them in place. 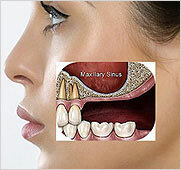 When the sinus wall is very thin, a sinus graft or sinus lift is needed to allow the implants enough bone to anchor. The sinus graft allows us to provide permanent fixed implants as an alternative to loose fitting dentures. If you have difficulty speaking, eating, swallowing or breathing, you may have an uneven jawbone. Oral surgery may be needed to move all or part of your upper jaw, lower jaw, or both into a new position that is more balanced, functional, and healthy. For first time denture users, oral surgery can correct jaw irregularities to ensure that your dentures fit perfectly. For long-term denture wearers, oral surgery can add bone graft to support bone that may have deteriorated over time providing a proper fit for your dentures. The TMJ is the small joint in front of the ear where the skull and lower jaw meet. When this joint is off by even a small amount, it can create ongoing headache and facial pain. If medications, physical therapy, and splints can’t resolve the problem, joint surgery may be a recommended option.